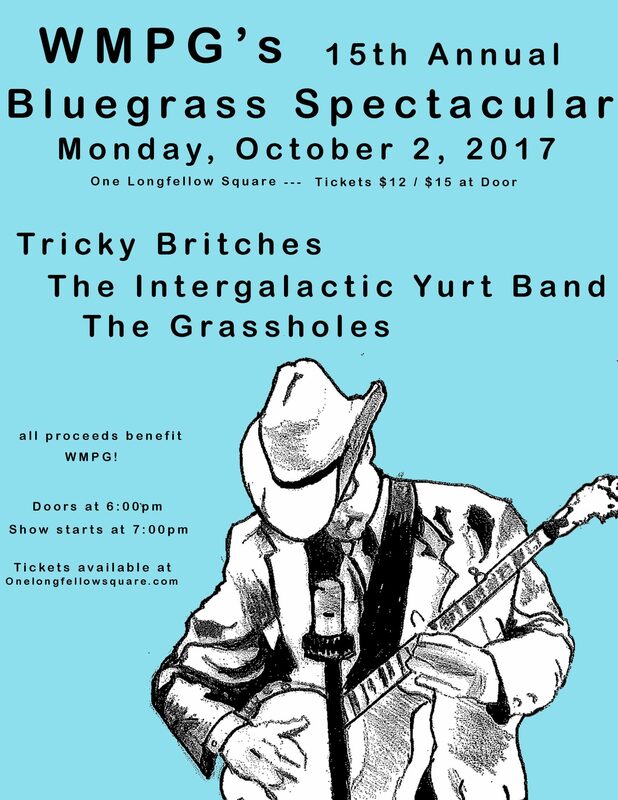 On Monday, October 2, WMPG Community Radio presents the 15th Annual Bluegrass Spectacular at One Longfellow Square. 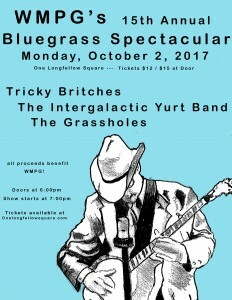 Local Bluegrass bands Tricky Britches, The Intergalactic Yurt Band and The Grassholes will perform. Doors open at 5:30 PM; the Bluegrass Spectacular begins at 6:30. Tickets are $12 in advance, online at OneLongfellowSquare.com. General admission tickets at the door are $15. Proceeds of the event benefit WMPG Community Radio, the volunteer-run broadcast voice of the people of southern Maine. 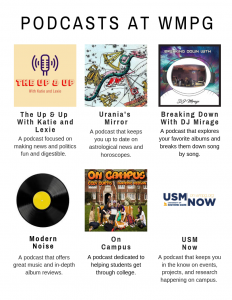 WMPG broadcasts diverse programming which reflects the communities it serves. WMPG broadcasts at 90.9 FM, and also streams online 24 hours/day at wmpg.org. For more information or to get involved in community radio, visit wmpg.org or contact Dale Robin Goodman at 207 780-4151 or email development@wmpg.org. Tricky Britches formed in 2009, when four friends in Portland, Maine, took their fiddle tunes and country songs on the road across the US. Since then they have released three albums of original material: Comin’ in Hot (2016), Good Company (2013), and Hard Fought Day(2011). They have played on stages big and small across the US, Hawaii, and Europe, but at the end of the day, their favorite show is still on a crowded street corner at midnight. OR at a WMPG Bluegrass Spectacular! From across the Universe to a solar system near you, inspired by the spirits of Woody Guthrie, John Hartford, Elvis and Jerome Garcia, playing songs of love, heartbreak and celebration drawn from the deep well of Americana – Certified Organic Music -this is The Intergalactic Yurt Band. The Grassholes are a traditional bluegrass collective that’s been roaming the streets and bars of Portland and greater Maine since 2001. The Grassholes are Field Rider on banjo, Merrill Marsh on guitar, Flann O’Brien on bass, Heather Kahill on fiddle, and Sam Pfeifle on guitar and vocals. Like Flatt & Scruggs, Bill Monroe, Bob Dylan, and the Grateful Dead? Then you might just like the Grassholes.